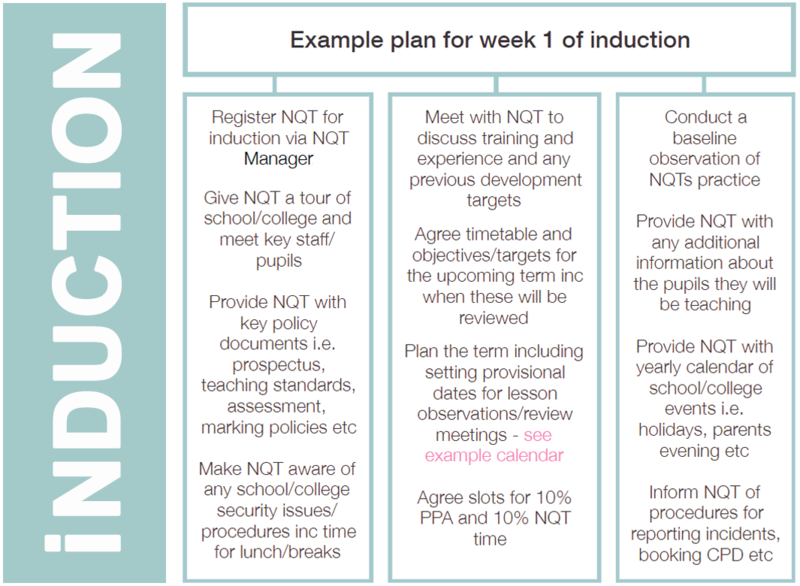 Taking into account each individual NQTs training, experience and development needs an induction term plan could look like the illustrations on this page, however each programme will be different and your plan will vary for each NQT. An end of term review/assessment meeting to discuss progress, what you will be writing in your assessment and establish clear areas for development and targets/ objectives for the following term even if an NQT is leaving your school/college - the next school/college will also want to know exactly where the NQT is upto with Induction and have a starting point for the remaining periods. At the beginning of the induction period, the NQT should have an opportunity to discuss the outcome of experiences during and if appropriate, since initial teacher training. The induction tutor and NQT should agree development priorities and set objectives for the first period of induction. Objectives in the induction period need to be carefully considered and designed to meet the individual needs and circumstances of the NQT. They need to be challenging but realistic, with a precise focus linked to the teaching standards and only the teaching standards, making it easier to review progress and provide evidence in the assessment reports. Very important note - Performance Management / Appraisal arrangements do not apply to NQTs or NQT Induction. 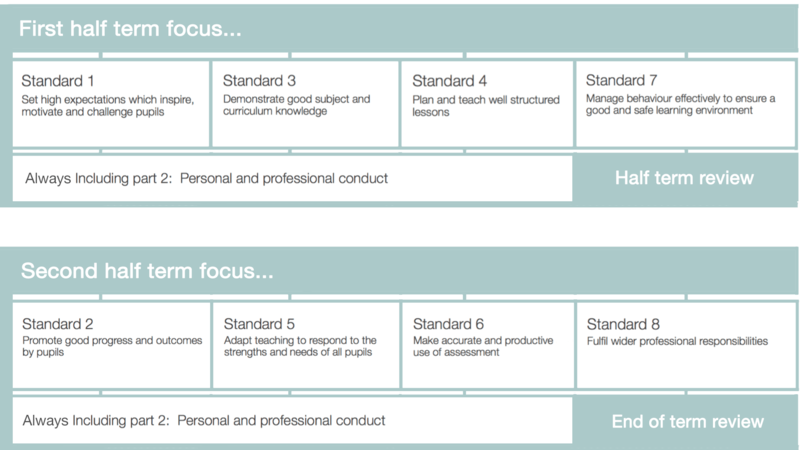 You must only assess an NQT against the teaching standards. It is a statutory requirement that schools/colleges assess an NQT against all of the teaching standards, every term of induction. While this may seem daunting, please see the example illustration below showing how you might cover all of the standards during an induction term. Please note: the illustration is an example only and will vary depending upon the training, past experience and development needs of your individual NQT at their current stage of induction.